Fluorite is an attractive mineral to collectors, jewelers and artisans, due to its many bright translucent hues. 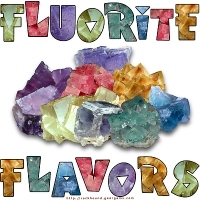 In this colorful Fluorite Flavors design, the variety of specimens look almost good enough to eat, which, along with the clever alliteration, was the inspiration for the unusual caption! You can get it on t-shirts, apparel, bags, clocks, mugs and ceramic items, mousepads and other quality apparel and giftware products. Buy one now for your favorite rockhound – or get it for yourself!